Russian art market: a rebirth? 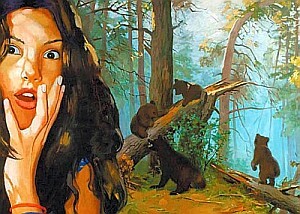 A parody by Vladimir Dubrossarky and Alexander Vinogradov: a heroine is placed in painter Ivan Shishkin's "Bags in a Pine Forest"
The rebirth of private art collections has been one of the most significant cultural and social movements of the past 20 years. Before the Bolsheviks nationalised private property, Russia had some of the world's finest private art collections. Vyacheslav Kantor, one of Russia's richest businessmen with interests in fertilisers and real estate, has spent the past decade building up a collection of 20th-century artists, including works by modernists Marc Chagall, Chaim Soutine, and Amedeo Modigliani, as well as post-war legends such as Mark Rothko and Ilya Kabakov. In the past decade, a new elite has eagerly returned to old collecting traditions, motivated by a number of factors - ranging from aesthetic appreciation, a need to decorate the home and art as investment, to a desire to acquire the trappings of power and prestige. The Russian onslaught on world art markets began when billionaire Viktor Vekselberg scooped up the Forbes Faberge Collection in early 2004 - just months before it was to be auctioned at Sotheby's. That purchase cost him more than $100m, though the final figure has never been revealed. "There's very strong interest in impressionist and modern masterpieces among the wealthiest people in Russia," says Marina Goncharenko, a Moscow art collector, and director of GMG Gallery. "They'd rather buy art that has stood the test of time and which is a serious financial asset. They're more likely to spend millions of dollars on a work by an easily recognisable well-known impressionist or modern artist, than spend $100,000 on a work by a little-known contemporary artist." Kantor's collection includes Modigliani's Seated Girl in a Black Dress (1918), bought at Sotheby's in 2000 for $15.6m on a top estimate of $12m, and Soutine's Le boeuf ecorche (1924), which sold in February 2006 at Christie's for £7.8m ($13.8m at the time) on a top estimate of £4.8m. Until February 2007, it held the record as the most expensive Soutine painting sold at auction. Kantor also raised the bar for leading Russian post-war artist Ilya Kabakov when, in 2008, he bought the artist's Beetle (1982) at Phillips de Pury & Company for £2.93m ($5.84m at the time), an auction record for Russian post-war art. His collection forms the Museum of Avant-Garde Mastery in Geneva, where he has a home. However, Kantor is one of only a handful of major Russian collectors who have gone public. Many do not speak about their art holdings, citing privacy and security issues as reasons for their reticence. Chelsea FC's billionaire owner, Roman Abramovich, is considered another important Russian collector. He is believed to have spent $120m in May 2008 at Sotheby's and Christie's to secure a painting by Lucian Freud and one by Francis Bacon. Abramovich never confirmed the purchases. Dealers and gallery owners point out that the increase in art sales between 2004 and 2008 in Russia was, in large part, due to a booming real estate market, and the need for the rich to decorate these new flats and homes.With the property market now moribund and the Russian government forecasting it could be another three years before the economy returns to 2008 levels, the slump in Russian art purchases will probably last until then. But, despite the current economic difficulties, the fact remains that wealthy Russian collectors will remain priority targets to be courted by art dealers and international auction houses.